Contract talks between the International Longshoremen’s Association and the U.S. Maritime Alliance ended on Dec. 6 after a disagreement over automation at terminals, leaving negotiations at a standstill without future talks scheduled. The collective bargaining agreement — known as the master contract — expires on Sept. 30, 2018. It covers 14,500 port workers on the East and Gulf coasts. James McNamara, a spokesman for the union, said that the two sides were unable to bridge the gap on definitions for the terms “fully-automated” and “semi-automated” when it comes to the terminals and equipment within those facilities. The U.S. Maritime Alliance, which represents the terminal operators and steamship lines, met with the ILA in Hollywood, Fla., on Dec. 5 and Dec. 6, but the union ended the discussions in the afternoon of the final day. However, McNamara denies that the union walked out early and that the day was almost over when the union walked out of the meeting. ILA President Harold Daggett instructed the members to return home to bargain with local ports. The Port of Virginia already has automated stacking cranes and is beginning a multiyear expansion project to double the amount of the cranes at the Virginia International Gateway and start using them at the Norfolk International Terminals. 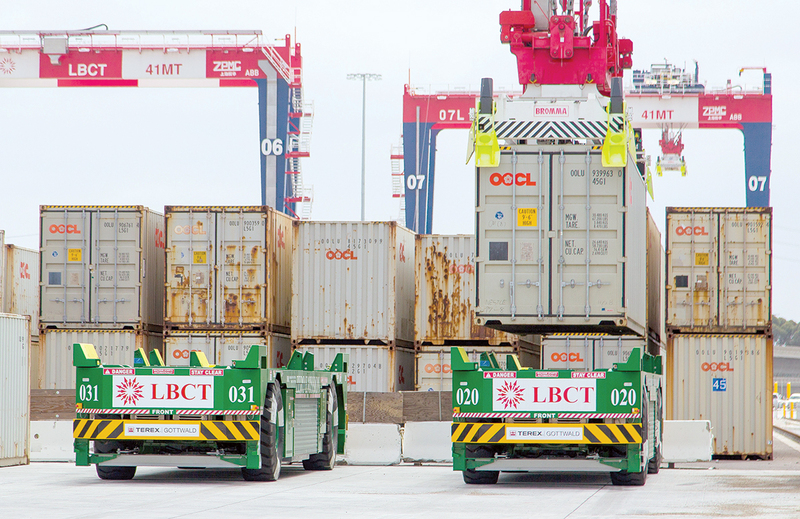 Global Container Terminals operates a semi-automated terminal in Bayonne, N.J. Nevertheless, automation on the East Coast doesn’t match the sophistication at Middle Harbor in Long Beach, Calif., or the technology employed in Europe and Asia. Under the current master contract, any workers displaced due to technology are supposed to be retrained for a new job or paid a guaranteed wage. Jon Slangerup, chairman and CEO at American Global Logistics, told Transport Topics that the unions are understandably concerned about what automation means for the stevedores, but also points out that Orient Overseas Container Line and the International Longshore and Warehouse Union were able to reach a deal to cover Middle Harbor. Slangerup was the Port of Long Beach’s executive director from 2014 to 2016. “You have to make it a win-win situation. In the case of Middle Harbor, the way that it evolved was quite brilliant. First, OOCL invited the union to Hong Kong to talk about automation. From the very beginning, the union had a chance to address its concerns and had input throughout the process,” he said. Although the union worries that automation will slash the workforce, Slangerup said that at Middle Harbor, union labor still sit in the cabs of the ship-to-shore cranes and operate the backroom controls on the container yard equipment. He said the result was a net addition in jobs, not a loss. “In my estimation, longshoremen love working at an automated facility because it’s safer, cleaner and more efficient. Some of the new jobs also pay better,” Slangerup said. In a short statement, the USMX stated that the discussions with the union were “open and frank” and that it expects the talks to continue in the future, although no official dates were scheduled. Slangerup said he remains hopeful that the two sides will negotiate a new contract, possibly looking to the West Coast to create a framework on the automation issue. “It certainly would be very, very bad for our industry if these talks were to break down or cause slowdowns on either side,” Slangerup said. Over the summer, the International Longshore and Warehouse Union and the Pacific Maritime Association ratified an extension to its West Coast master contract to 2022, even though the deal wasn’t set to expire until July 2019.